Our head of research, Sammy De Grave, is the lead author of a paper published in Scientific Reports last week. In this paper he and his co-authors propose to remove an entire ‘order’ of crustaceans. But just what is an order, and why would we want to get rid of one? Biologists organise all life into ranked groups. The most familiar, and at the bottom level, are genus and species. These are recognisable in the format Homo sapiens, where Homo is the genus and sapiens is the species. One of the higher groupings is called an order. For crustaceans, there are around 70,000 known species grouped into approximately 50 different orders. One of these orders is the subject of the paper mentioned above – it’s called Amphionidacea – and the odd thing about it is that it was created in 1973 for just one species, an enigmatic open-sea creature called Amphionides reynaudii. Although the species has been known since 1833, relatively few specimens have been collected and almost none since 1973. Some larval stages have but recognised, but only three adult males have ever been found and no intact adult females have been collected. The reference illustration above is a composite of 43 damaged specimens. Lacking good research specimens, the status of this creature has long been debated. Luckily, in 2011 Jose Landeira, a biologist on Gran Canaria, collected six specimens. As usual they were extensively damaged (you can see this in the photograph at the top), but a specialist genetic lab at National Taiwan Ocean University was able to extract some small fragments of DNA. 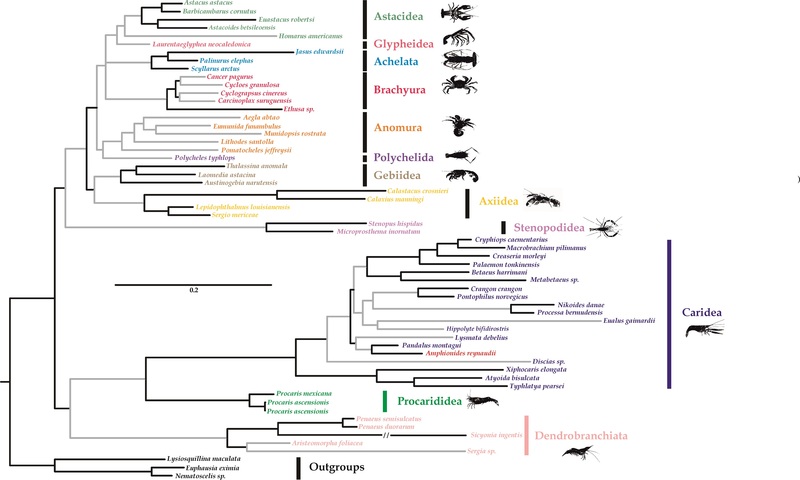 Building on earlier work by a US group, the sequences were analysed and the results show that Amphionides is not a separate order after all, but merely a shrimp. You can see where it fits in the taxonomic scheme of things by clicking the chart below. In keeping with its oddball status, however, many questions remain unanswered. Amphionides larvae have been recorded across all oceans from the tropics to subtropics, but almost no known shrimp species have such a distribution as adults. And although the genetic analysis reveals a strong affinity to a single family of shrimp (Pandalidae), it remains unclear which genus or even species it could be the larvae for.